Speaking : as a warm-up, we clapped our hands saying different activities. For example: ver/la/te/le/vi/síon, we clapped our hands 6 times while saying the sentence. We did it several times and I then clapped my hands without saying anything and students had to guess the activity. I then let students had a go and we played the game for a good five minutes. As the lesson was after lunch, this was the perfect way to get my students focused as they really had to concentrate and to listen carefully to the number of claps. 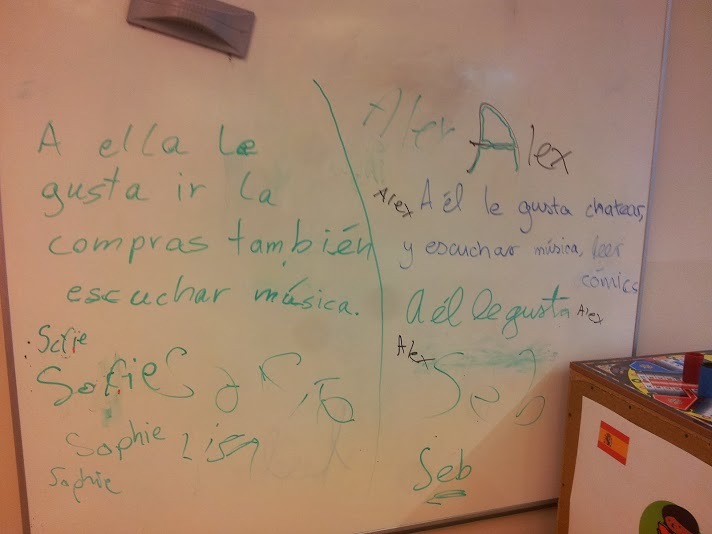 Reading : I then had my students work in pairs and match cards (activity/sentence with picture): ir a la playa, tocar la batería, leer comics, hacer los deberes, ir de compras, navegar por Internet…. I told them they had to really listen to the answers and try to memorize them for the next activity. 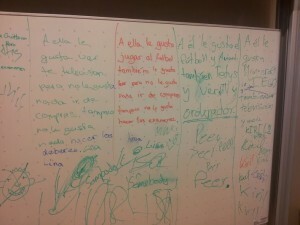 Writing: this time, my students had to write on the big white boards in my classroom, what one of their classmates like or doesn’t like to do. They could not mention any name but they should start with: A él/ella (no) le gusta…. Reading: the final step was to read each paragraph on the board and to guess who the person was by writing a name next to the paragraph. My students could also correct a mistake if they spotted one (which some of them loved doing!). 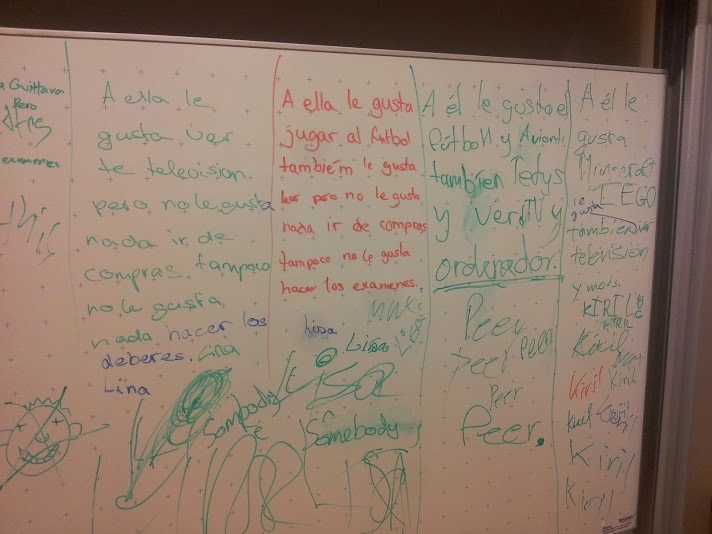 This lesson did not require much preparation nor lots of resources, apart from the matching cards which were included in my textbook Gente Joven 1 and markers for the white board. Because the students didn’t have to write in their books “the traditional way”, they were engaged throughout the lesson. Without noticing, they got to practice “gustar” a lot and to refer to different people!